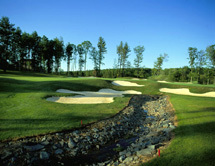 Woodloch Springs is a golfing and recreational community located in the pristine mountain landscape of Northeastern Pennsylvania. Open since 1992, this breathtaking course has been recognized nationally by both GOLF Magazine and Golf Digest as "one of the finest courses in America" and has been dubbed a "rare find" in Met Golfer. With four sets of tees on every hole, all levels of play can be accommodated. Sculptured bunkers and water holes, bridges and miles of cart paths reflect the strict attention to detail for which Woodloch is famous. The outstanding, signature 14th hole requires a dramatic carry over "Hell's Gate Gorge" which is carved from the rugged mountainside by a rushing stream some 200 feet below. Terrain: Elevation changes. Water hazards in 16 holes. Very unique course. Miscellaneous: Proper golf attire required.